Iran's supreme leader says the United States has created the “myth” of nuclear weapons to paint Tehran as a “source of threat.” The tough rhetoric comes days before nuclear talks are set to resume in Vienna. "They created the myth of nuclear weapons so they could say the Islamic Republic is a source of threat,” Khamenei said in a televised address to a hall of several hundred military commanders, as cited by Reuters. “No, the source of threat is America itself, with its unrestrained, destabilizing interventions," he added. Earlier, Iran's most powerful figure, argued no deal on Tehran’s nuclear program was possible without the simultaneous lifting of all sanctions against the country. The US has rejected the condition. 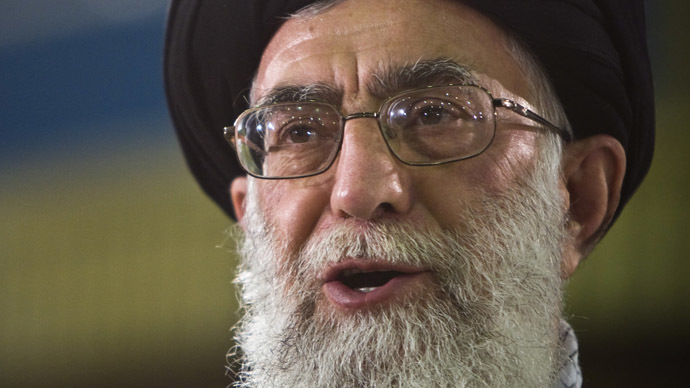 Khamenei urged the Iranian military elite to be ready to repel any attack. The statement has been seen as a response to the Chairman of the US Joint Chiefs of Staff, General Martin Dempsey, who earlier said that deliveries of Russian S-300 air defense missile systems to Iran would not affect America's ability to strike Tehran's nuclear facilities. The deputy commander of the Islamic Revolutionary Guards Corps (IRGC), Hossein Salami, has meanwhile rejected a demand by US Defense Secretary Ash Carter, who said a final nuclear agreement must include inspections of Iranian military sites. Salami described possible inspections as a "national humiliation." "This subject is treasonous and selling out the country, and if anyone speaks of it, we will respond with hot lead," he said, in comments cited by state news agency IRNA.